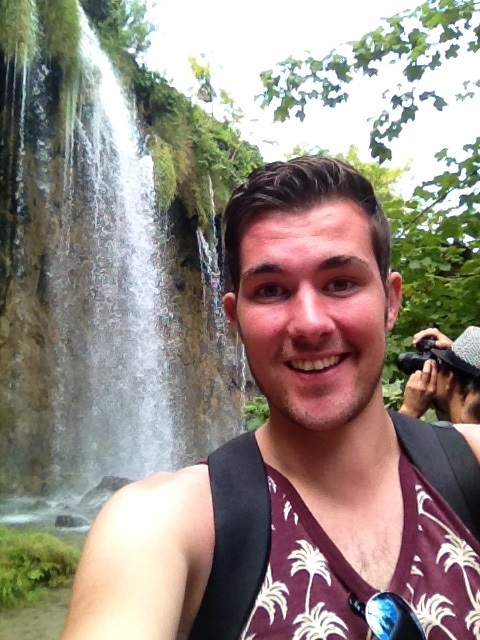 I was pretty excited to be going to Plitvice Lakes. Bouncing along on the road on the bus going north-east from Zadar at the accepted morning time of 8.30am, the two-hour journey would go by in a blur. It certainly did for me as I was too busy still trying to fix my iPhone that suddenly stopped charging. Could it be that there’s too much debris in the battery port, who knows. 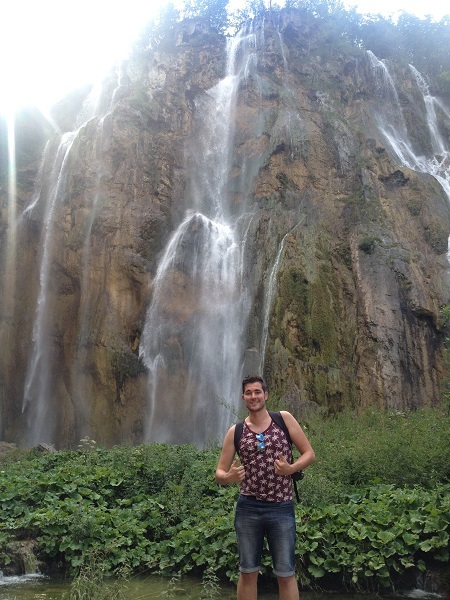 I was obsessed and kept a running commentary much to the amusement for Mark, who told me to forget about it and enjoy the UNESCO Heritage Site that is the Plitvice Lakes. He was right. 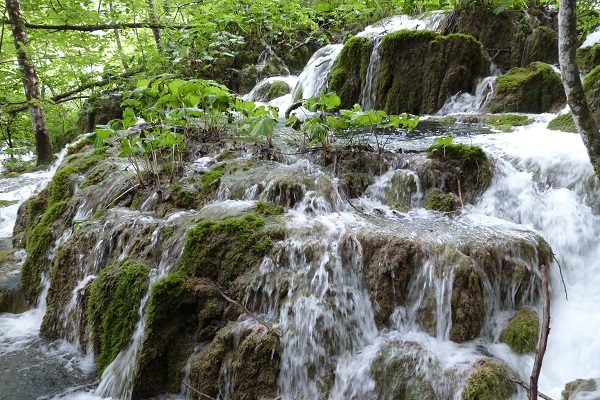 As soon as we got to the entrance of the Plitvice Lakes, it was time to forget my troubles and immerse myself in the calming beauty of the waterfalls found within. If only, we remembered out warm gear! We had been travelling in Croatia for about a week now, and we could just about cope with the August heat by stripping down to the bare minimum allowed. 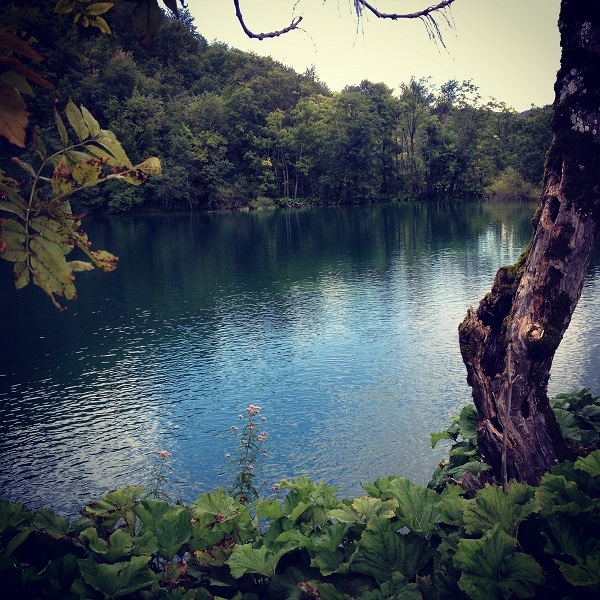 So when we arrived at Plitvice Lakes, we totally forgot the site was based high in the mountains and away from the sea. The result? Both Mark and I shivered to the bone as we remarked how crisp and cold the air was while we searched our bags in the hope of finding layers to put over our vest and shorts. It was not at all fruitful. 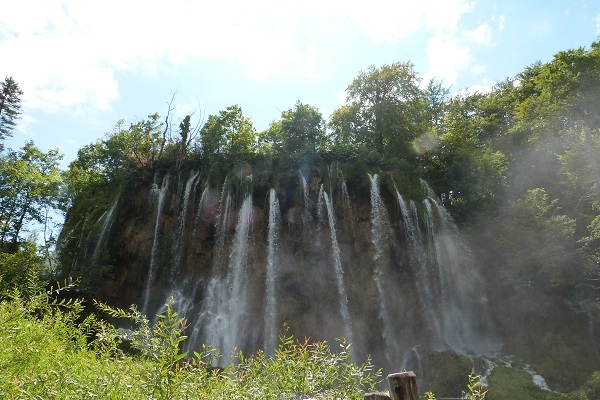 So, high tailing it to the nearest coffee shop, we picked up a pamphlet on what we could do in Plitvice Lakes and taught ourselves about the area as we steamed our faces with the warm, frothy smell of our coffees. 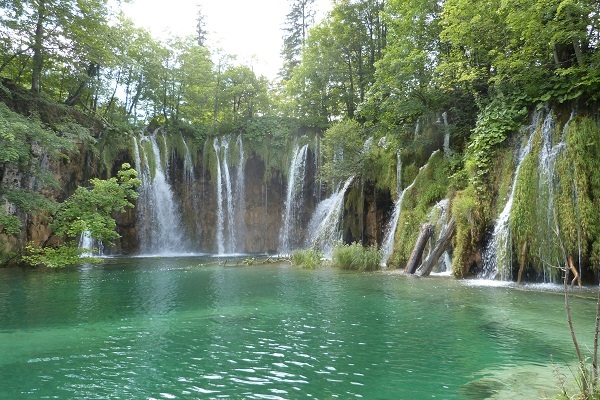 Lying halfway between Zagreb and Zadar, high up in the forested hills, there lies a beautiful and majestic scenery called the Plitvice Lakes National Park. 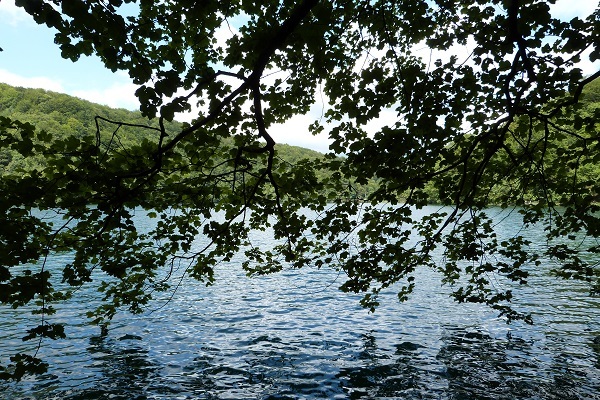 Within, stunningly blue and tranquil lakes and connected by a series of waterfalls and cascades, accessed by wooden footbridges and pathways surrounding them. 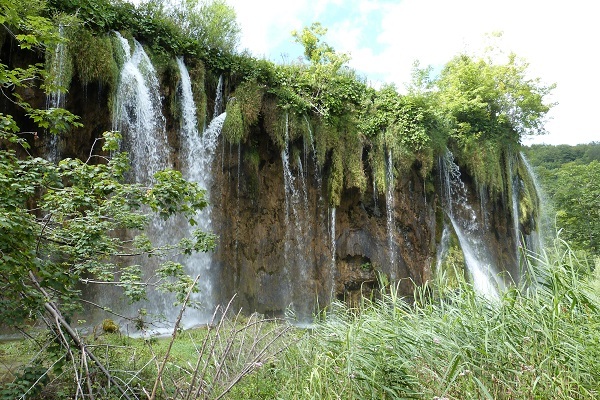 This beautiful natural scenery was so popular that in 1979, UNESCO proudly proclaimed Plitvice Lakes as a World Heritage Site. As I recounted this to Mark, he simply agreed. 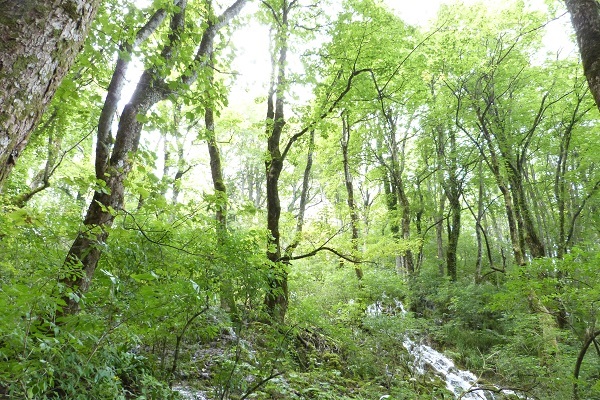 All you had to do was look around at the rich green hills around, supplied by the clear fresh water. 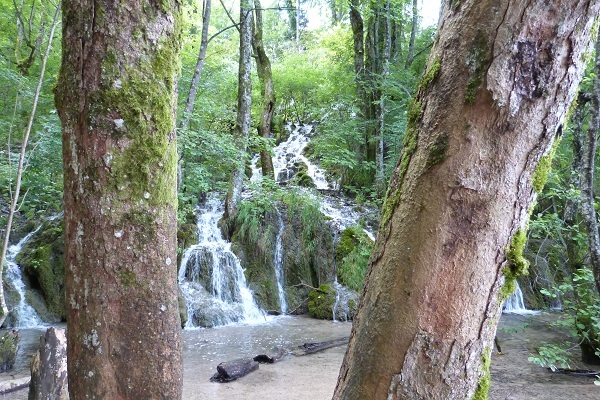 We also noted that a variety of wildlife could be spotted here including bears and wolves (gulp!) but there were also deer, foxes and badgers. It comes to no surprise that rare bird species can be spotted here including kingfishers, storks and owls. 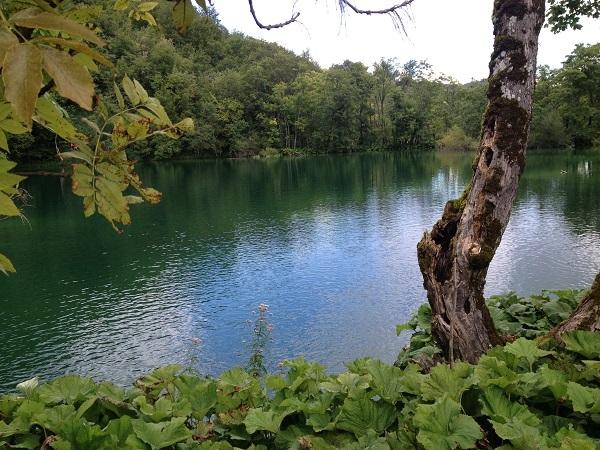 Reading up on the history, we were pretty stunned to find out the Civil War began in Plitvice Lakes on 31st March 1991 that destroyed and changed the course of nations in a cruel and damning war. 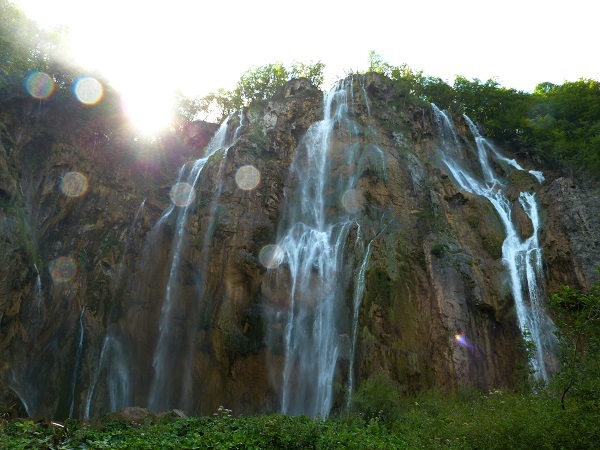 Serbs took control until 1995 and since then, there have been a long reconstruction of facilities to put Plitvice Lakes back on the tourist map. You can tell it has been successful as buses after buses line up in the car park to splurge out tourists from far-flung places such as Japan and Australia. 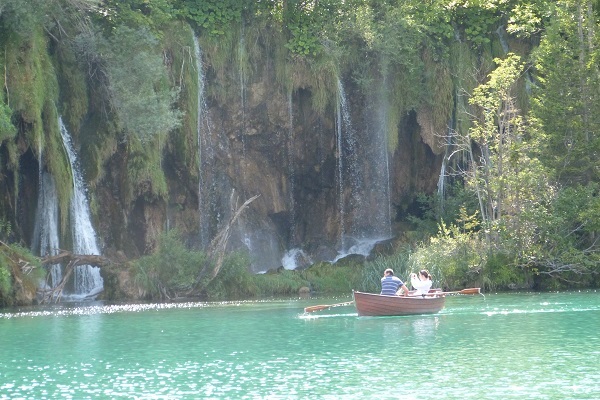 So what’s the appeal of Plitvice Lakes? 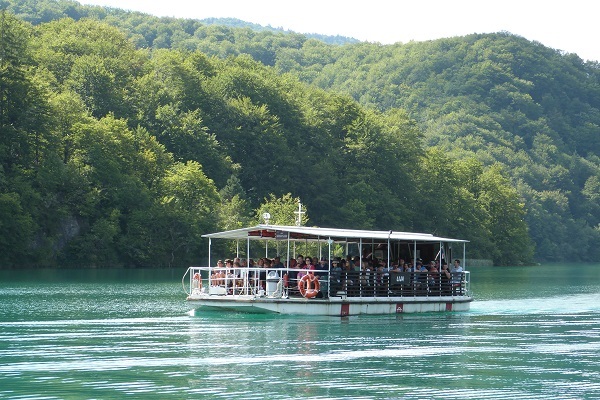 We were recommended to enter Plitvice Lakes at Entrance 2 by our bus driver so we can have an easy amble down to the tourist information office to buy our entrance tickets. 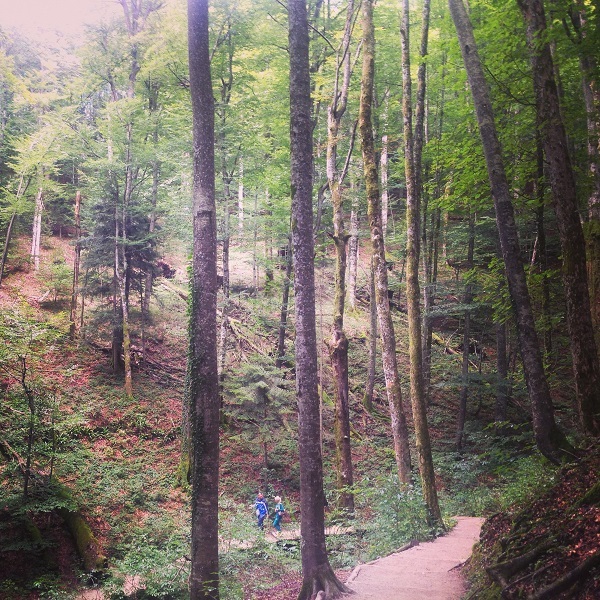 Costing 110 kuna, you are also given a brochure map and within, you’ll find a network of trails to follow that will get you around the national park. 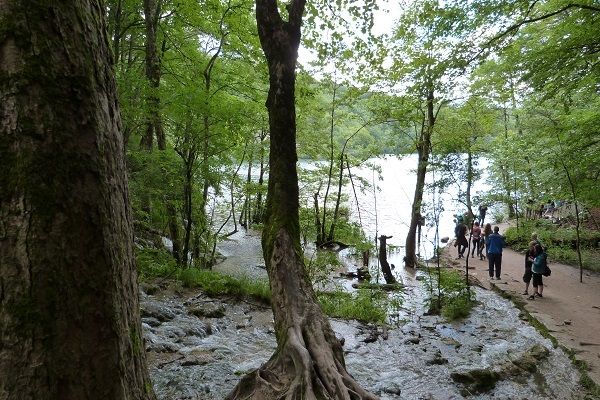 Remember to plan accordingly how long you will need to be at the Lakes as each trail will take you a length of time ranging from two hours to eight hours. 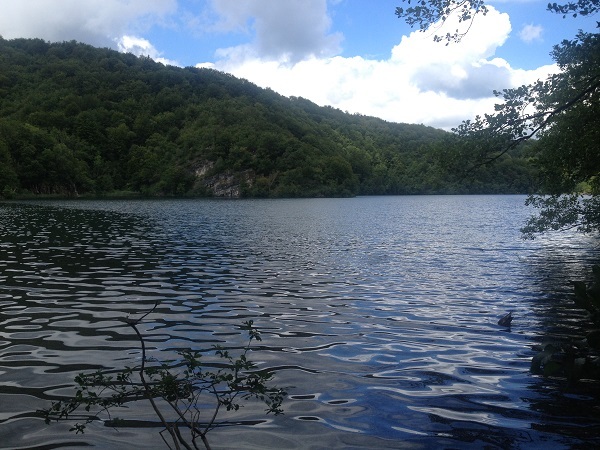 We opted for the four-hour hike around the lakes involving a bus to the top, many wooden trails and a boat ride across Plitvice’s biggest lake, Kozjak Lake. Before you start the hike, make sure you are well stocked with food and drink supplies as refreshment stops are far and few between. At the end of your trail, you can reward yourself with a well-earned ice cream and shop for souvenirs back at the entrance. I didn’t need any souvenirs, I had my memories. With a quick two-hour journey back to Zadar, you’ll surely spend it looking through the bazillion of photos that you’ve taken of the scenic landscapes, roaring waterfalls and the deep green rolling hills of bursting life. Stay tuned for part 2 of Day 6! Thanks Matt. 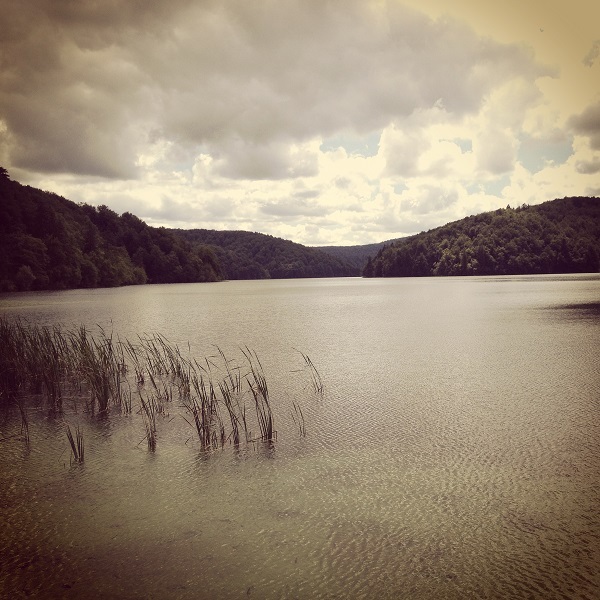 Why don;t you look at booking a holiday or a backpacking experience in Croatia? Hey Ed – your photos are beautiful!! 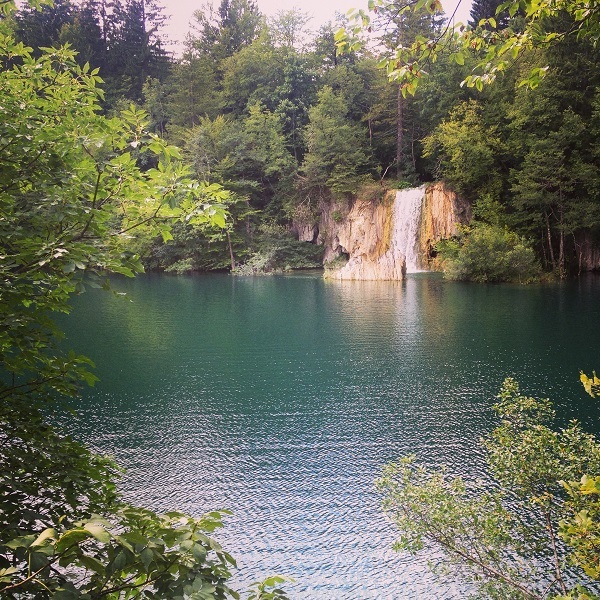 Plitvice looks like such a gorgeous place. A friend of mine visited a few months ago and I couldn’t stop drooling over her pictures, either. It’s definitely at the top of my list!